The Village of Minerva Park was incorporated in 1940, but the process of developing the old amusement park site into a housing community had actually begun in the 1920’s. Progress was drastically slowed by the Great Depression, but in 1940 Minerva Park finally incorporated as a municipality. The incorporation created a Village government consisting of a Mayor and a Village Council along with a police and fire departments. By the 1970’s the Village of Minerva Park had grown to its current boundaries, spreading SE from the corner of State Route 161 and Cleveland Avenue to Westerville Road. Today, Minerva Park’s population is relatively steady at approximately 1,277 people living in 564 households. Minerva Park residents also enjoy being a part of the Westerville school district and the greater Blendon Township community. 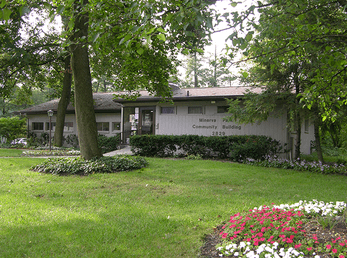 The Minerva Park Community Association (formerly the Minerva Park Civic Association), was founded in 1971, and continues to serve Village residents today. Bob Gale and his family have lived in the Village of Minerva Park for over 55 years. Family members of several generations have been involved in various volunteer entities including the Pool Board, Women’s Club, and the Community Association. In 1992 the MinervaFlora garden committee had been recently formed in conjunction with the AmeriFlora celebration. Bob has been a member of that committee since the beginning and the Chair since 1998. From 2004 to 2009 Bob was the President of the Minerva Park Community Association. While not an officer anymore, Bob is still active in the Community Association as Chair of MinervaFlora Committee which also oversees the care of 161 Flower boxes at the Ponderosa-SR161 intersection, Chair of the Sunshine Committee (which sends greetings to residents per events in their lives), and the MPCA Representative to NCC. He was the winner of the MPCA Citizen of the Year Award (Duck Award) in 2000 and was honored with the NCC President’s Award in 2010. The CODI Star Award (national library software user group) was given to Bob in Minneapolis, MN in 2005, registering a star in his name in the Milky Way. Bob is a two time graduate of The Ohio State University (BA in History and MA in Public Policy and Management) and a graduate of Case Western Reserve University (MSLS in Library Science). Bob retired from the Newark Public Library System (now the Licking County Library) in 2008. Jenny Lin serves as a Minerva Park representative to Northland Community Council. She is actively involved with the Minerva Park Community Association and serves as president of the Hawthorne Elementary Parent Teacher Organization. She is also heading up a new group called Northland Partners for Opportunity under the Northland Alliance. This group aims to bring together different sectors with an interest in the community to network and collaborate. She recently completed a Master of Public Health, and also has a Master of Science in Journalism, both from Ohio University. She has lived and worked in a variety of locations in the US and abroad and moved with her husband and three boys from Beijing to Minerva Park in 2013. She quickly grew to love the community and developed a passion for doing what she can to connect needs and resources, with a particular interest in the area’s diverse New American population.